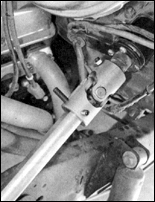 Classic Performance Products Borgeson Power Steering Update. Complete tech article show you how! 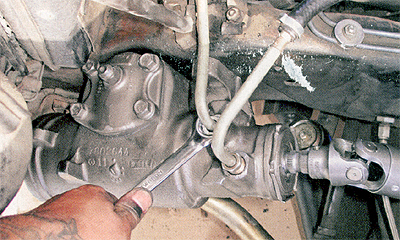 For most people, steering can be broken down quite simply: power or manual sloppy or tight working or not. 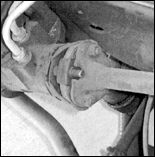 Usually, it's not until that last one that folks start realizing the differences in various steering I components, especially the effects they have on their truck's performance. The older I get, the more I appreciate a good power steering setup. And why not the less effort needed to make my truck turn, the better. But unlike a manual setup, where my hands were quick to report any possible problems whether in the box, the suspension, or the tires power assist can sometimes mask those little indications (at least for me). 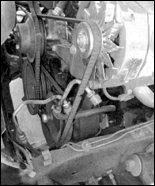 In the past, the only time I gave any attention to a power steering system was if I heard that unforgettable whine or felt any pulsating in the steering wheel. Other than that, if it was quiet and smooth, it worked. But was it working correctly? Up until now, I thought it was. When I first took my '75 Cheyenne out to California Speedway to track-test the suspension, our guru test coordinator web manager Nick Licata quickly commented on how "off" the steering was and its effect on his slalom course times. Doubting his mechanical knowledge, I just told him he wasn't familiar enough with my truck, but he strongly disagreed. From that point on, I began to see what Nick was talking about the steering's responsiveness (or lack thereof) was not as quick as it should be rather, it was kind of sloppy. There wasn't excessive play, mind you, it just took more steering wheel rotation to navigate the truck. This was over a year ago... things gradually worsened. 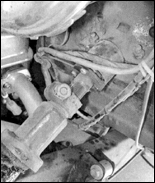 Seeing that the rag joint and slip yoke on the column were all but done with, I called the steering experts at Borgeson Universal to see what they thought. 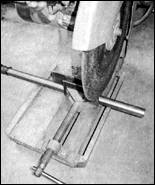 Instead of replacing the OE components they suggested a trusty set of splined-to-double-o (DO) joints, especially since I was already using an ididit column. Since I tend to drive the truck more like a sports car at times, they suggested I swap the old worn out Saginaw box for a quicker ratio one except they were out of stock at the time. Borgeson steered me to one of their major dealers, CPP. who just happened to be right down the street from me, but more importantly, had the Saginaw 800 I needed on the shelf. With all the components in hand, I set out to make the swap. As it turned out, the job was easy two hours under the hood before the truck was back on the road. But what was even more surprising were the results. I had no idea just how .loose myoid box was until I piloted the truck down the street for the first time with the quicker-ratio (one full turn quicker compared to stock) Saginaw installed. Any movement on. 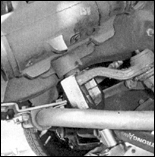 the steering wheel is immediately transmitted through the wheels. With the old box, you'd have to turn the wheel from 12 to 3 o'clock to get the same results! 1...All you need to upgrade your C-10's steering: Saginaw 800 power steering box from CPP, U-joints (1 xDDx1x48 and 3/4xDDx13/16-36), and a double-o intermediate shaft from Borgeson. 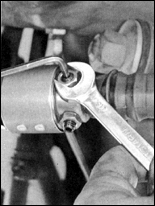 The 36-spline joint is the vibration reducer model, which features a urethane interior designed to limit the amount of vibration transmitted to the steering wheel. 2...Up until recently, the old Saginaw seemed to be holding up decently until someone pointed out the fact that it was pretty loose. Hey, it wasn't leaking or squeaking, it just took a bit more effort to relay communication to the wheels than it should have. 3...I'm pretty neutral about rag joints. I've never had a problem with one in the past, but still, just the fact that the word "rag" is used in a steering component doesn't sit too well with me. No worries, it will soon join the real rags leftover from the conversion in the trash. 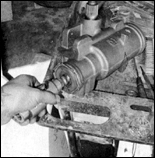 4...As for the stock steering column joint, well, here's no question its time had come and gone quite some time ago at that! 5...It doesn't matter if you start the removal process at the column or the pitman arm I chose the latter, making sure the front wheels (suspension loaded) were pointed straight forward before pulling the arm off the box. 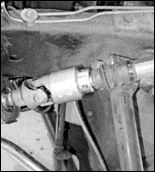 Typically, the sway bar won't cause interference, but if you're using low profile frame mounts like me, it might get in the way. 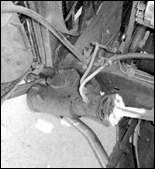 6...Assuming your system is "wet," it's not a bad idea to throw a drip pan, towel, or what have you beneath the box when removing the power steering hoses. 7...To keep the remaining fluid in the system and off your chassis and driveway, cap the lines off and I tuck them aside for the time being, as shown. 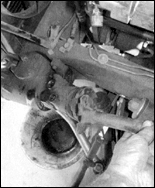 8...Continuing on with the removal process, the rag joint is secured to the box's output shaft with two bolts. 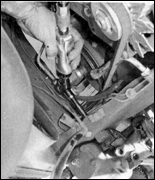 9...The upper collar is held in place with a single bolt clamp once undone, the intermediate shaft can be removed for good. 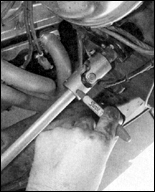 10...Space is tight, so it's probably easiest to undo the steering box with an air ratchet just make sure to break them loose manually, unless you enjoy slamming your knuckles real hard! 11...If you're going it alone, secure the box to the frame before removing the last mounting bolt. I did so with a large C-clamp, which worked perfectly. 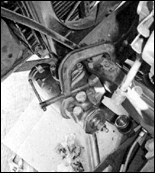 12...Since the old box was removed with the wheels straight, I took the new Borgeson joint and centered the output shaft before installing the new steering box, In doing so, I realized how much difference there would be when the shaft made one full turn less than the stock one. 13...Just as I did during the removal, I used the large C-clamp to secure the box while I started the bolts from the inside of the framerail. And speaking of hardware, I used new Grade 8 bolts (threads coated with anti seize) with new lock washers. 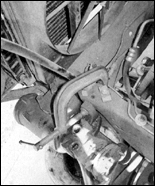 14...With the box secured against the frame, the pitman arm was ready to be installed. If the splines don't line up just right, reach up and grab the output to manually mesh them with a U-joint. 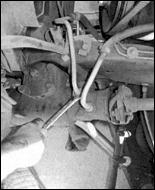 15...If there's any question about your power steering lines condition, replace them especially the high-pressure line. CPP has kits available so you don't have to deal with the local parts house headache. 16...No more rag-joint, that is. 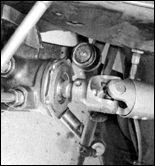 The upgrade U-jolnt from Borgeson is also a vibration damper, so along with absorbing the shuddering, it will compensate for chassis flex as well with the absence of the old slip joint. 17...Borgeson double-0. intermediate shaft. Oversize, it requires shortening to fit properly. With both U-joints installed, I set the shaft in the lower joint (where it would end up mounting) and marked the spot above where it needed to be cut. 18...To keep the cut square and fairly clean, I used my chop saw. Once cut, I filed the fresh edges down smooth to eliminate any burrs. 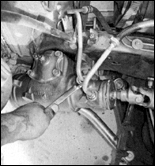 19...Unlike a setup with varying angles, with the steering box a straight shot below the steering column, you don't have to worry about U-joint bind, so no need to keep the intermediate shaft way below the knuckles. However, that doesn't mean you cram it all the way bottomed out in the joint, either. 20...The same goes for the lower application. 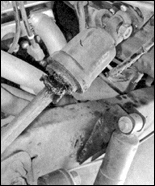 On the steering box's 13/16-36 output shaft, you'll notice the splines are separated by a recessed groove-make sure the U-joint slips over that, allowing the set screw to lock fully. 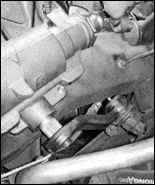 21...On the upper U-joint, there's a longer set screw that's meant to secure the joint through the shaft. 22...On the flat side of the D as shown with everything mocked up where it's going to mount permanently. 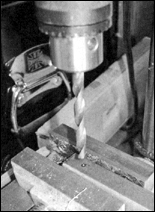 23...Then drill the shaft, but only through one side, as you want the set screw to bottom out against the other side's inner wall. 24...Make sure every set screw is tightened and locked down appropriately. After the first 100 miles or so, go back and retighten. 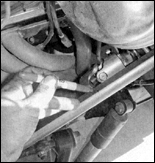 25...Once you've got the box connected to the steering column, fill the system up with fluid. With a dry box, you'll want to fill the reservoir up and then turn the engine on to cycle fluid through the box. This may take a few times, but make sure to get it filled properly to avoid any damage. From there, hit the road and enjoy your rehabilitated steering.